This is gorgeous. Is it off-grid? Good job guys! There isn’t ANYTHING that I’d change. This is PERFECTION!! While I’m not crazy about lofts, yours is perfect. You kept it light and gave yourselves headroom – not a cubby hole. From your paint colors, landscaping – EVERYTHING, it just cannot be improved on. Excellent teamwork!! Just curious, what is the purpose for the wench – the ropes? in the first interior picture, the ropes and wench seem to deal with the ladder to the loft. Just my thoughts. 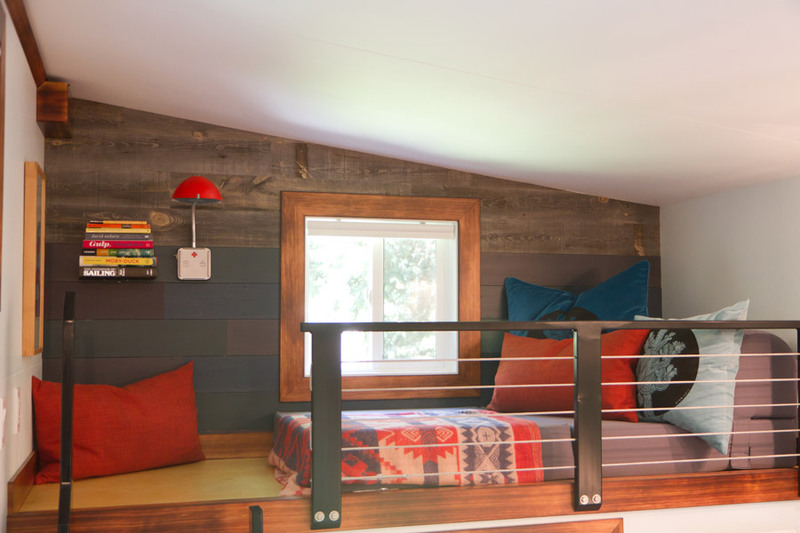 In the pictures on the Airbnb website it shows that the ladder can be pulled up by the wench so it doesn’t interfere with the seating. There are 73 photos on that site. 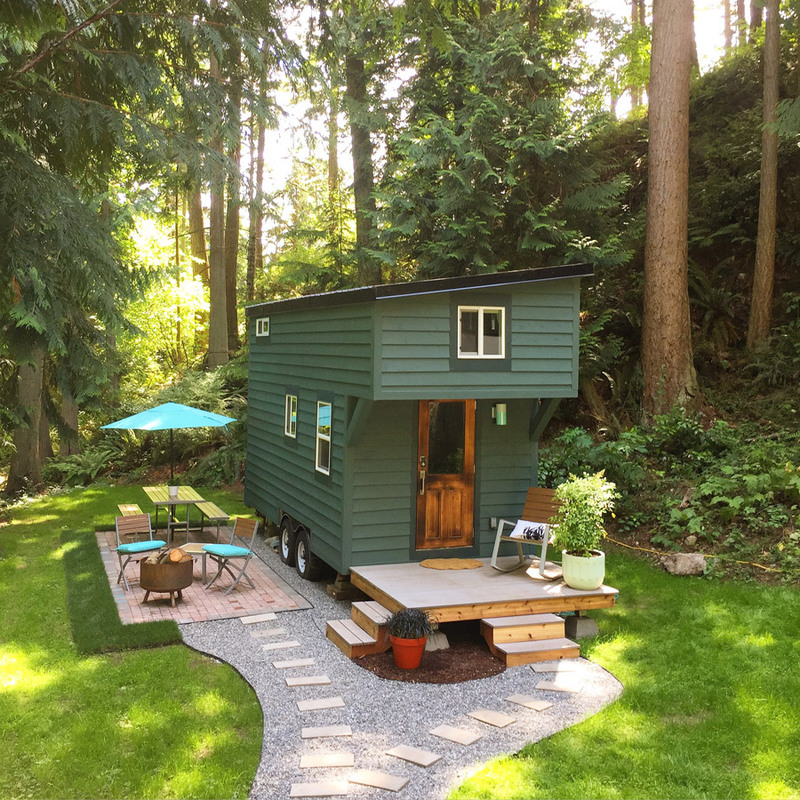 I absolutely love this tiny home! SO MANY brilliantly done things! Kudos! 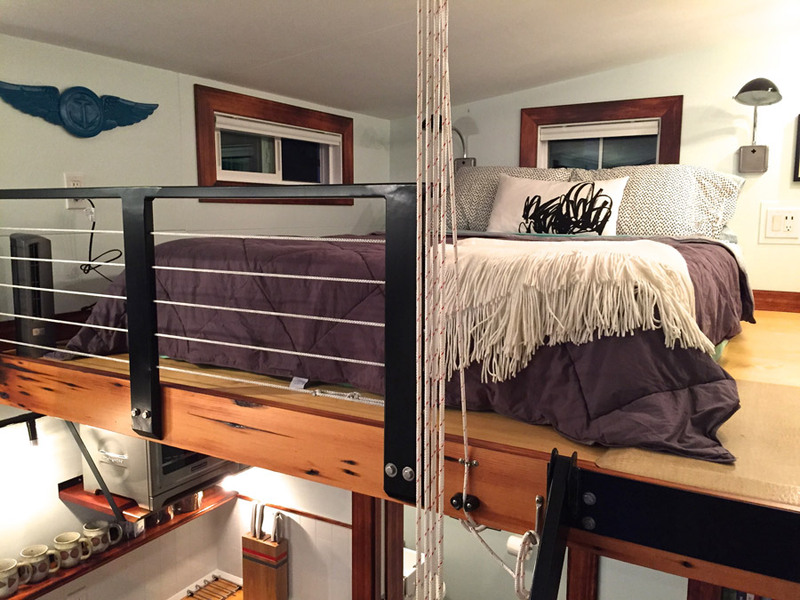 The rope is a pulley system that lifts the ladder up in the air which folds and stores against the overhead loft, making the couch below have more lounge room when you want it. 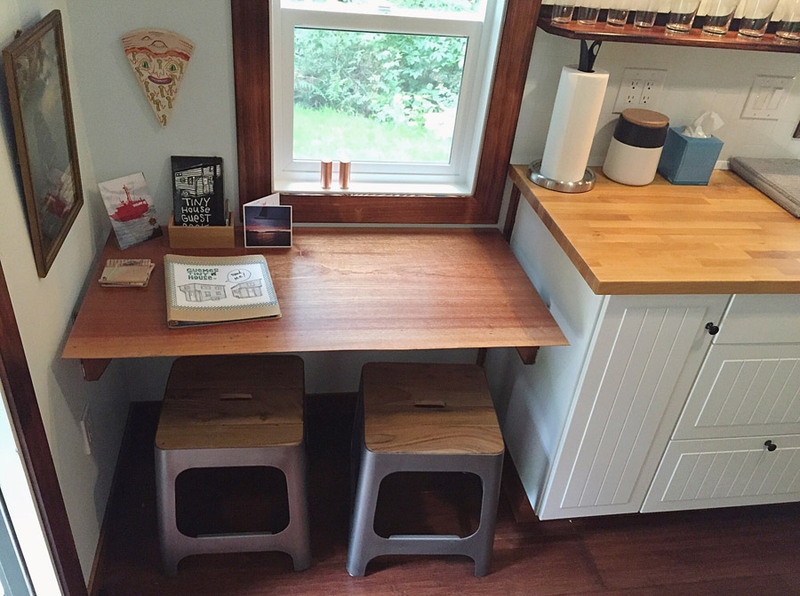 This shows a wonderful use of space…..the best I’ve seen. Would you mind sharing the square footage and your costs? (not to include the wonderful artsy features) You have done a wonderful job!! It’s perfection. I can’t wait to make plans to stay there! Love it, just not sure what the pulley is for? This house is an inspiration of design. Impeccable and sublime in it’s elegant practicability, great job! 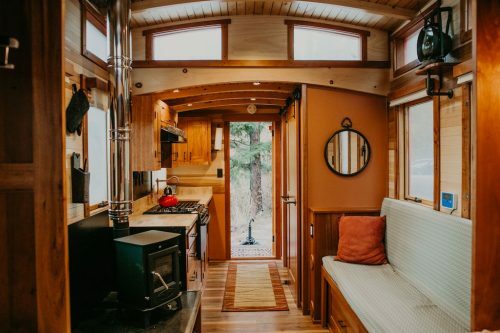 I’ve been looking at tiny houses for year, yours is the nicest one I’ve seen. Did you come up with the idea yourself or did you buy the plans? GREAT JOB! Love this- It is my dream to have a tiny house- so simple – So elegant- this is adorable! Perfect. The best tiny house that I have seen. Fantastic job. This is lovely, but for myself, I would need a one floor plan, with maybe a hidden bed, because a ladder would be just not plausible for me. Even stairs are a problem. Otherwise, perfect! Is that a Kona Brewing Co. beer on the counter? Good choice! Are plans available? Love it! What are the dimensions of your home? Really love it! I like these, but , what about designing one for the disabled? Who can’t, climb ladders. 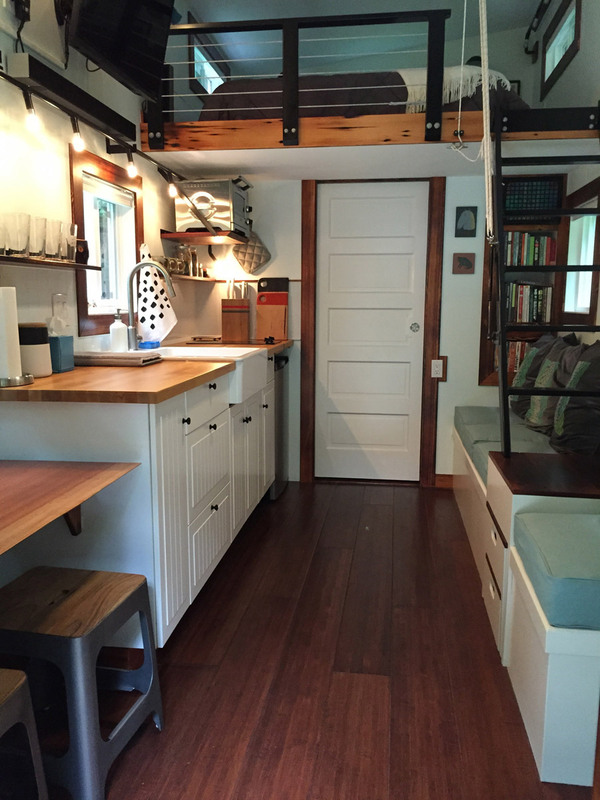 This is one of the best conceived of and executed tiny houses I’ve ever seen. Well done. Gracie. the ropes hoist the loft ladder up and out of the way to access the couch better. 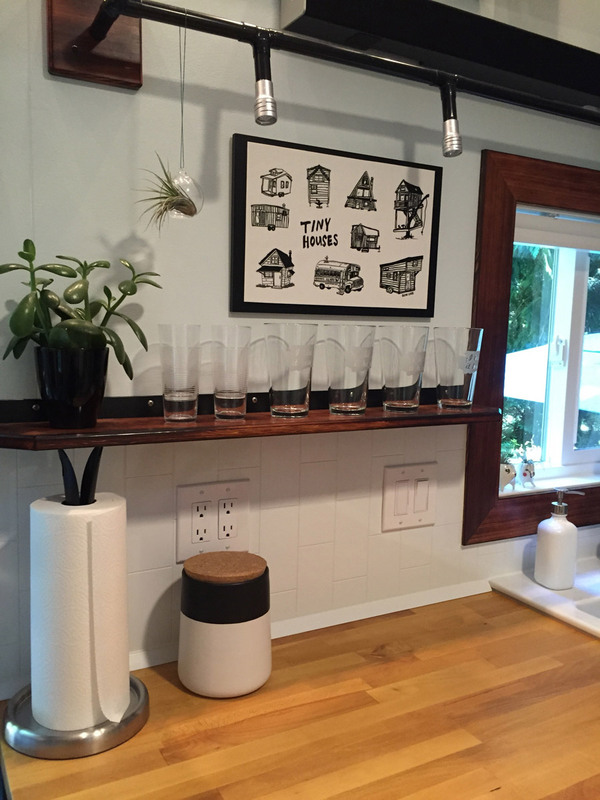 If you go to their airbnb link you can see a bunch more pictures, one of which shows the ladder in the up position. Love this! One of my favorites. Perfect except I would prefer steps (with storage). Very lovely! Wow, what a fantastic job they did with this THOW! I’m really impressed. Mega kudos! I’ve been looking at tiny houses here for quite a while, and this is the first tiny house that merits a comment from me. Very well done. Many guest house tiny houses don’t factor in a whole lot of things that this does. 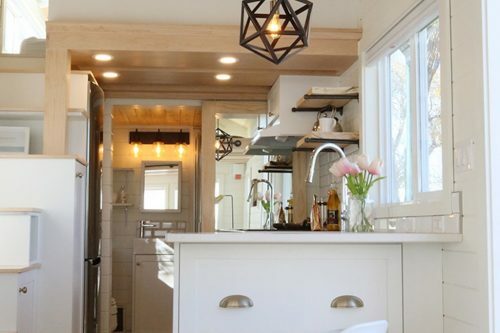 This looks like a functioning tiny house, with all the design details that one would want. Bravo. 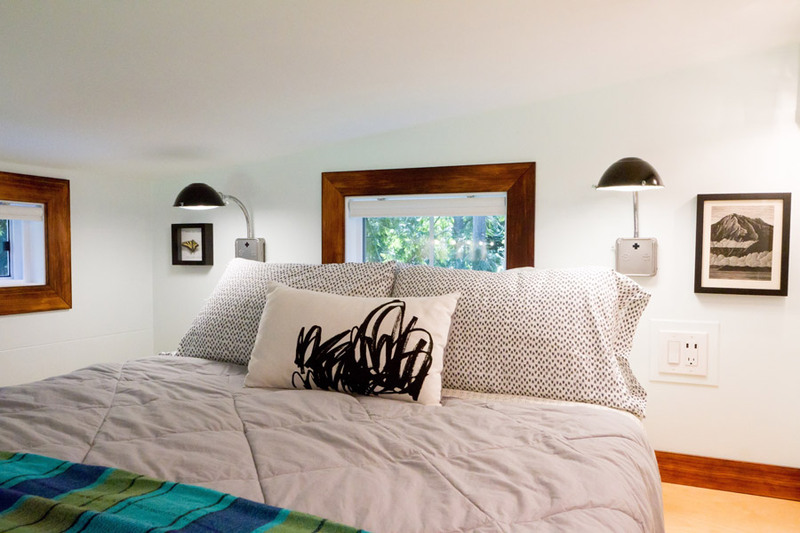 I’d love to know the source for the sconce with the orange shade (the lighting fixture in the loft). No luck checking the usual sources. 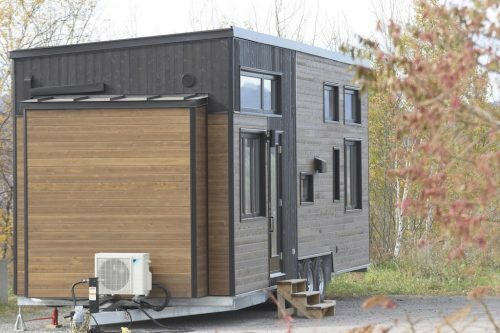 This tiny house design is great! Beautiful lines, colors and design. 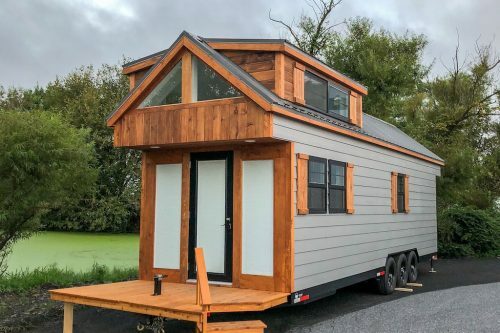 The only things I would change (so it would suit my needs that is) would be to bump out the front for more interior room and get a fold down front porch like the guys at Molecule Tiny Home design. 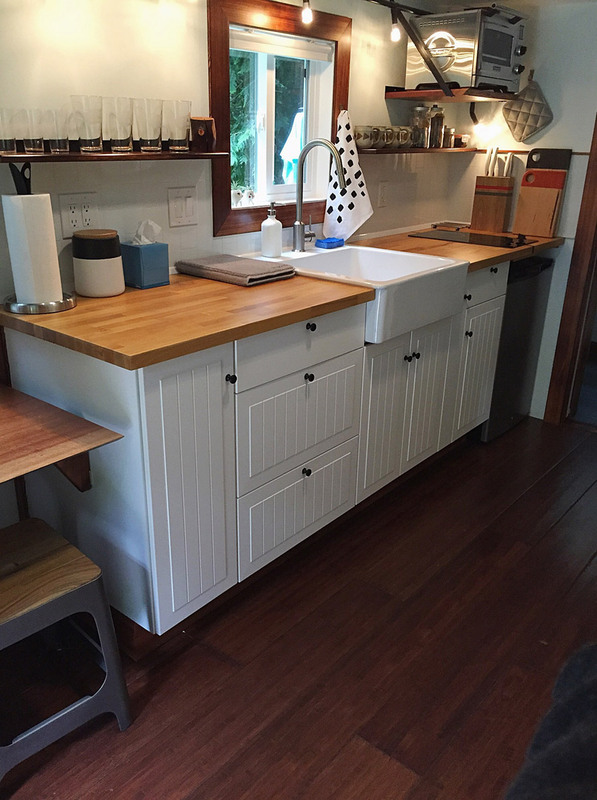 Then I would switch the eating/table area to be across from the kitchen area–giving more cooking and food prep room if needed. To me it does not make sense to have a couch across from the kitchen sink, though to each his own, of course! Then I would want to create an L-shaped couch and more of a living room feel under the second loft. I also would want a tub because I love my baths.But I understand this is for rentals so it doesn’t need all that stuff. Great bathroom closet in this one! I also love how the stairs go down to the storage and the storage comes out as steps. Very cool. Great inspiration on this one. Hope I can find the plans or someone has posted them here. Great work on this! So beautiful cute and comfy. we spend alot of time on vancouver island and san juan island must look yu up on airbnb. I have fallen in love with his tiny house. Could you please tell me what your cost to build it was? Your cost without the artisan touches. What is the square footage? You have created an amazing space!! I think this is a great guest cottage. With every one I see I pick up one or two ideas and will put them,someday, into my own tiny cottage. This is my second favourite Tiny Home after Esk’et. I’ve taken a look at the photos on AIRBNB and it looks as though you live in a beautiful part of the world. This is lovely, homely, and very spacious. But I couldn’t rent it. I would have to live in it. Absolutely my favorite tiny home design and I love the outdoor area. Well done! !